Canada was explored by men travelling in canoes on its rivers and lakes. So was Manitoba, except for La Verendrye's travel on foot and horseback in the southern parts. And the fur trade also was carried on by canoe. The Hudson's Bay Company had to compete fiercely with the North West Company for furs at the end of the eighteenth century. It, like the Nor' Westers, had to use canoes to come up from the Bay to trade on the Saskatchewan and the Athabaska. But it was difficult to build canoes at its posts at York and Churchill, because no birch trees grew there. The Company's men were not skilled canoe-builders nor canoemen, as were the French-Canadian voyageurs who served the North West Company. However, the Company's men were mostly Orkney men from the Orkney Isles, or Highlanders from northern Scotland and the Western Isles. Many of them were boatmen, skilled in boat-building and in rowing and most of them had a strain of Viking blood, for the Norsemen had settled in the Orkneys and Highland Scotland. Some of their boats even suggested in their build the ships of the Vikings. 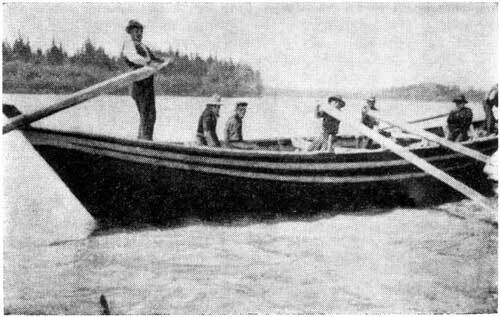 It was natural for the Hudsons Bay Company then to experiment to see whether boats might not replace canoes in the fur trade. Their Orkney boat-builders in the years after 1800 worked out a boat that proved to be able to carry more goods at less cost than canoes. Because they were first built at York Factory and went to and from there, they were called "York Boats." In time a standard form and size was settled on. The York boat was "clinker" built, at least in part. That is, the planks, or boards, which made up its sides, were overlapped, lower edge over upper edge, instead of being put on edge to edge. 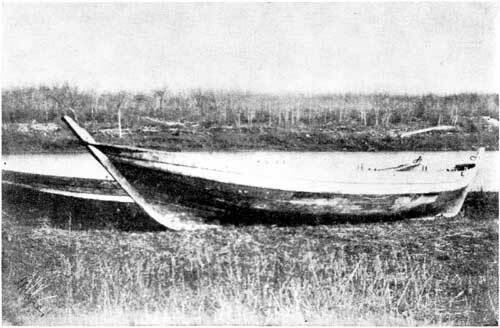 The Vikings ships were clinker-built too, as the fishing boats at Gimli still are. The stem and stern of the York boat were both pointed and both "raked." They leaned out, that is, forward and backward four feet from the end of the keel. This made it easier to push them off rocks and shoals. Thus the York boat was a very distinctive craft, faintly suggesting the Viking long ship. The boat was about twenty-eight feet long at the keep and thirty-six from tip to tip, eight feet wide in the middle, and three or four feet deep. It had a crew of eight men, six oarsmen, a bowman and a steersman. The oars, or sweeps, were very large, and to balance them the oarsman was placed on the opposite side of the boat to that on which the oar lock was. He stood up to push the oar forward and sat down as he pulled his stroke, and very hard labour it was. When the rivers were shallow the boats were poled, when very swift they were "tracked"; that is, pulled with two ropes by the crew along the bank. When the wind was from behind, a square sail was used, to the relief of the oarsmen. At the portages the great boats were pulled over on rollers made of logs, and they stood up to this rough usage better than canoes. This longer life was part of their superiority but the chief advantage was that with eight men a York boat could carry about three and one half tons of goods, which was more than the largest canoe could do with the same crew. So the York boat replaced the canoe as the freight carrier of the North West. In the 1880s it was itself replaced by the steamship on the larger rivers and lakes, and slowly fell into disuse. The boat yards at York Factory and Norway House were abandoned. The old boats rotted on the beaches. In the south only one was saved as late as 1935. You may see it at Lower Fort Garry.